Pawns: Pawns can only move forward. On their first move, they can move one or two squares. Afterwards, they can move only one square at a time. They can capture an enemy piece by moving one square forward diagonally. Bishops: Bishops can move any number of squares diagonally. 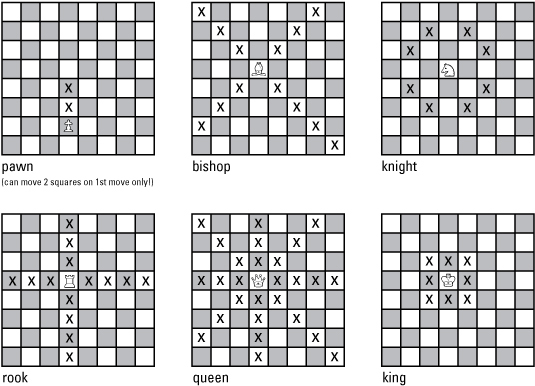 Knights: Knights can move only in an L-shape, one square up and two over, or two squares over and one down, or any such combination of one-two or two-one movements in any direction. Rooks: Rooks can move any number of squares, up and down and side to side. Queens: Queens can move any number of squares along ranks, files and diagonals. Kings: Kings can move one square at a time in any direction.